The Nifty posted positive returns on a year-to-date basis in 2018 while the midcap and smallcap index saw a deep correction. The earnings growth remained in single digits and the PE Ratio continues to trade at expensive levels. Most of the retail investor’s portfolio was in midcap and smallcaps. This is where the pain was in 2018. A lot of stocks had corrected by 50% (Read: Sentiments – Market correction and more) and popular names have trapped investors. The Alphamultiple portfolio rose +0.67% for the quarter. We outperformed the Nifty 50 TRI but under-performed the mid & smallcap TRI. On a YTD basis, the Alphamultiple portfolio fell (9.04%). 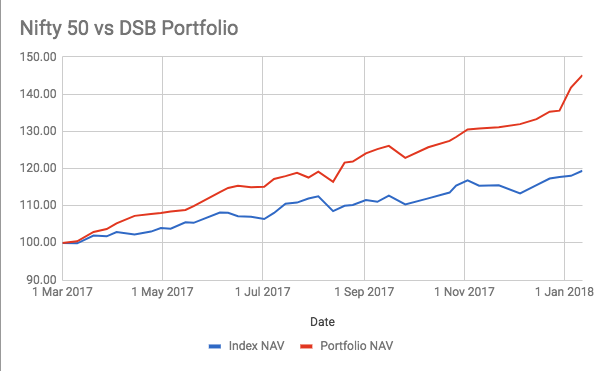 We maintained high cash positions in the portfolio throughout the year and have recently increased allocation above the 50% mark (Read: Live Portfolio). This quarter, we had one exit – Dewan Housing. The stock crashed more than 50% in one day and we exited immediately. However, we had partially booked profits in June and the allocation to the portfolio was low. We added two stocks to the portfolio in this quarter. Both the stocks have a different client base (B2B and B2C) and we have a 3-5 years view on each of these stocks. The companies are debt free, cash rich, generate high ROE and have a long runway for growth in the years to come. Do subscribe to our telegram channel: Click here. In this post, we detail the Q2FY19 Alphamultiple Portfolio performance for the quarter ended 30th September, 2018. We document our portfolio performance on a quarterly basis for the benefit of our readers and those who are interested in knowing the performance of our advisory service. This post focuses not on the company results but on the price performance. While the quarter was a great one for the largecap indices, the small & midcap indices performed poor by delivering -5.19% and -13.68% returns respectively. The largest drawdown on our portfolio will be ~ 17% from the peak. However, for most investors the drawdown is in the range of 10% to 15% from the peak due to low allocation to equities and high cash position of the portfolio. We have been on more than 50% cash in the portfolio since early 2017. The cash will be utilized to add good companies at low to fair valuations. We booked out Dewan Housing and Muthoot Finance in June by nearly 50%. Thus, our portfolio did not take a major hit in the recent NBFC crisis. We have avoided NBFC space over the last few years except for the above mentioned companies. Investors will appreciate that we do not follow any thematic investing and avoid chasing trends. Yes we are. Markets have their own seasons and at present we are going through a steep correction in small & midcaps where the valuations were astronomically high. 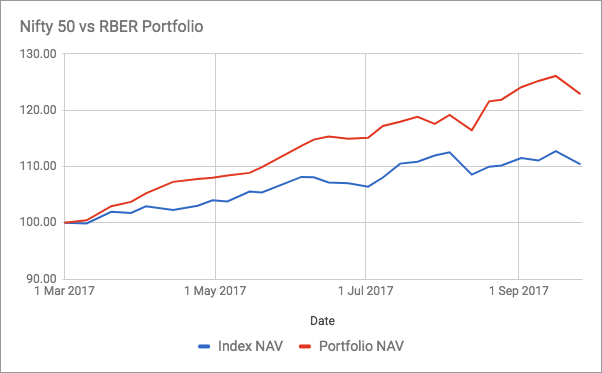 We feel that our defensive stance is now paying off as our portfolio is withering through the market correction without any major drawdown. Is this a good time to invest? Absolutely. If you are a serious investor, you have to face all the market conditions with confidence and patience. You cannot always be successful in trying to time the market by buying at the lows and selling at the peak. Investors who start now might not see consistently high returns over the next few months but they will be more disciplined than those who start investing when the bull market’s momentum is high. Our approach is not thematic but it is company specific. Ideally, we look to buy companies which can offer an expansion in valuation multiples as well as earnings growth. Also, it is important to Own what you know and know what you know. In this post, we highlight the performance of the portfolio for the quarter ended 30th June, 2018. We document our portfolio performance on a quarterly basis for the benefit of our readers and those who are interested in knowing the performance of our advisory service. This post focuses solely on the performance of stocks and not the company results. Our portfolio has under-performed the Nifty 50 (Total Returns Index), by delivering a +1.39% return against the Nifty 50 TRI’s +6.41%. While the quarter was a great one for the largecap indices, the small & midcap indices performed poor by delivering -2.97% and -6.94% returns respectively. We have out-performed both these indices by a convincing margin. The strongest performing stock of our Portfolio was Tata Elxsi which has a high allocation in the portfolio and has done very well since we purchased it in August 2017. Our portfolio is still below it’s lifetime highs although the drawdown has not been severe – primarily because we have a big chunk of the entire portfolio parked in liquid funds. To see our portfolio for new members, click here – Live Portfolio. Yes we are. Markets have their own seasons and at present we are going through a steep correction in small & midcaps where the valuations were astronomically high. Over the last one year, we have been defensive by having a high cash holding in the portfolio instead of trying to play the momentum. We feel that this stance is now paying off as our portfolio is withering through the market correction without any major drawdown. Is it a good time for fresh investments? For free trial – Click here. For membership plans and benefits – Click here. In this post, we highlight the performance of the portfolio for the quarter ended 31st December, 2017. We document our portfolio performance on a quarterly basis for the benefit of our readers and those who are interested in knowing the performance of our advisory service. Q4FY18 was a wild quarter for our portfolio. We lost ~ -6.36% on the portfolio against a – 3.96% fall in the value of the Nifty index between 29 December 2017 and 28 March 2018. This was an under-performance of 2.4% and this is first quarter of under-performance from our side. For new investors, the allocation to equities is 45% to 50% and for those associated with us since end of 2016, the allocation is now touching 80%. This was a tough quarter for the markets and PC Jewellers was a big reason of our under-performance despite having a very low allocation. As you can see, there was a wild swing in our portfolio from it’s peak in the 2nd week of January to it’s lows in the 3rd week of March. Our overall portfolio drawdown was 13.18% vs the Nifty’s drawdown of 10.72%. If your portfolio fell by more than 20% in this fall, you should be concerned about the risk profile and health of your portfolio. We are also satisfied that our portfolio has risen back faster than the broader market. For new members, we do not have Shakti Pumps, Bajaj Corp, Ambika Cotton, Indo Borax in the portfolio. Even the allocation of Tata Elxsi has been reduced to 4% of the portfolio from previous 8%. Q3FY18 was a good period for our portfolio with 15.37% returns. Nifty 50 index itself delivered 6.95% returns and thus we were able to generate an out-performance of 8.42%. Once again, we cannot complain of the performance and our reasonably satisfied. Our clients are heavily invested in liquid and ultra-short funds as we look for more opportunities to invest in. On a risk-adjusted basis, we have been doing reasonably good. We see no reason to take any unnecessary risk and deploy our funds in companies trading beyond our acceptable valuations. The above performance doesn’t include a neat Rs 19,000 profit in an arbitrage opportunity and dividends received. Both of these push up our returns further up! We have been bullish on the mid-cap IT space and have added a company from this sector (we might add 1-2 more this quarter), there are also companies which offer a high growth outlook and are available at fair valuations. More than our stock selection, one has to credit the high momentum that the markets are experiencing. The valuations are now looking very expensive and every step at this juncture has to be taken with immense care. PC Jeweller has turned out to be a neat 9 bagger (900% appreciation) for us and we continue to remain bullish on it (albeit with a lower allocation). This quarter returns were rather fuelled by the microcaps and smallcaps that form a small part of our portfolio but have delivered 60% to 80% in couple of months. To get access to our research backed investment advisory services, you can check out our membership plans. Our aim remains to generate high returns for our investors without taking any unnecessary risk. In this post, we highlight the performance of the portfolio for the quarter ended 30th September, 2017. We document our portfolio performance on a quarterly basis for the benefit of our readers and those who are interested in knowing the performance of our advisory service. Compared to a stellar Q1FY18 performance of 15.12% returns, Q2FY18 was rather modest with a 6.72% return. This is a good number for a quarter performance. Our portfolio outperformed the Nifty50 by 3.02% this quarter. We are satisfied with the performance when we look at it from a risk adjusted basis. Our client portfolios have heavy cash deployed in liquid funds as we await further investment opportunities. The cash also acts as a cushion in times of immense short term volatility. This quarter saw a little bit of volatility but there was no decent correction in the broader markets at all. 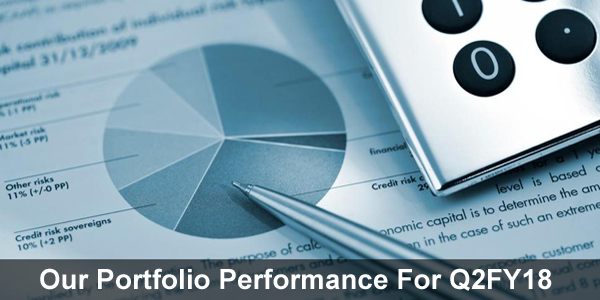 A graph of our portfolio performance is shared below. To read our Q1FY18 performance, click here. This month saw some new additions in the portfolio and also some profit booking. We increased our portfolio allocation in one of our branded jewellery investment. This company has appreciated by 640% since our recommendation is 2014 and we expect it to do good over the next few years. Further, we have added a new company to our portfolio with a 7% allocation. This company has outperformed its peers during tough times and has decent growth numbers and margin stability coupled with high return ratios which makes it a good investment for the long term. Shakti Pumps was a perfect turnaround investment when we invested a couple of years back. Noone believed in the company and its bad business model and when it crossed Rs 500, we had PMS managers, fund managers, advisory firms all chasing to get their hands on it. We have however reduced our exposure to Shakti Pumps as the current valuations are commanding a significant risk premium over the expected returns. Shakti pumps has appreciated by nearly 400% in 2 years since our recommendation. 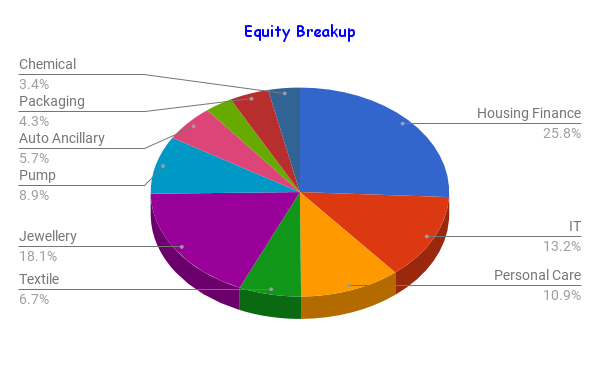 The above chart shows the breakup of the equity allocation only. We have 12 stocks in the portfolio with varying allocation and a debt-equity split which offers new clients an opportunity to invest over a period of time rather than all at once. Of 12 companies in our new client portfolios (2016 and later members), 10 companies have declared their results for Q1FY18. Two companies have seen a dip in their revenues on YoY (Year-on-Year) basis and two companies have seen a dip in their net profits. In a tough quarter for corporate earnings due to GST roll out hurdles, we are satisfied to see a healthy growth rate in our portfolio. Contrary to high valuation premiums of growth stocks in the current market scenario, our portfolio stocks are in the “Cheap-To-Fair” valuation zone on the EV/EBIDTA, PE Ratio and PB Ratio basis. Most companies have macro tailwinds in their favor and w expect revenues to grow at a healthy pace. We have always emphasized on the construction of a well balanced portfolio between growth and value picks. Of the 12 stocks that we own in the portfolio, 9 are selected based on triggers for revenue growth (apart from fundamentals) and 3 are because of a statistical bargain in terms of margin of safety and peer valuation gaps. It would be unfair to say that there are many bargain “value-picks” out there. In current conditions, we prefer companies with reasonable growth rates available at reasonable prices. In an earlier post (Read: Nifty 50 Earnings Analysis – Q1FY18), we spoke of the deflated rate of growth in corporate earnings which has dragged the Indian markets to a crucial juncture (Read: Markets at a Crucial Juncture) for a better understanding of earnings and valuations in current market scenario. 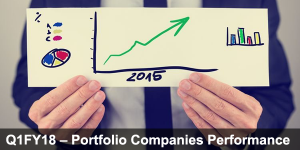 Our portfolio is cheaper than the broader markets and has a better growth in earnings. Ideally investors should focus on their portfolio and the individual stocks in that portfolio instead of the broader markets, however when the broader markets are heated up then the number of opportunities evaporate. However, in the month of August, we identified a wonderful company for a long term investment (3+ years).